avoid spending disproportionate amounts of time mentoring. I can't overstate how important it is to give the student good working habits from the very beginning. If you setup a good working relationship from the beginning, you are on for an awesome summer. If you let a student do things that frustrate you without sending immediate feedback about it, you'll both suffer during the whole summer. Because of the way school works, students are used to hiding their work until it's ready to be evaluated. Training them to show work-in-progress code so that you can provide early feedback and effectively help them takes time. You'll likely need to ask "show me the code, please" several times, encourage them, and comfort them that it's OK to show unfinished non-working code. Students are used to receiving feedback from one person, and are likely to send their work only to their mentor when requesting feedback or expecting evaluation. Encourage the student to discuss the project with all the relevant people and more generally to interact with the community; avoid private discussion of technical matters. Doing this has 2 interesting consequences: the time you'll spend mentoring the student will be dramatically reduced because the mentoring load will be spread across all your team (for me this often meant that when my student asked a question on IRC, he received a good and timely answer before I had even read the question! ), and the student will feel like he's part of your team, which increases the likelihood of staying around after the summer. Unless given specific directions, students tend to work on a branch or on a repository somewhere, and think about merging their code or getting a review only at the end of the summer. It's common to see student applications where the schedule says that they will do all the coding work, and then get a review during the last week of the summer to land the code. Experienced Mozilla developers knows there's no way sending a several-months-of-work-worth patch to someone's review queue and expecting a timely review will work. But students usually dramatically underestimate both the time it takes to get a review AND the time it takes to address the feedback (probably because at school they hand their work and only expect a grade, or a pass/fail in return). As a mentor it's your job to ensure they get their code through review. Urge students to write small patches, and get them reviewed as soon as possible. Students (and other developers ;)) will be tempted to 'just add one more little feature before attaching the patch'. Resist! Filing a new bug is easy. If the schedule of a student involves writing code without submitting it for review and inclusion, this raises a red flag for me: is there really no way to break this down to smaller pieces that could land separately? Don't hesitate to rediscuss the schedule with the student if you aren't fully happy with it. Given that the students are being paid money to participate in GSoC, it makes sense that lots of students will consider summer of code as "work", and have money be the primary motivator; which means that once they get the final payment, they disappear. This feeling can't be avoided in all cases, but if we can get the student to instead feel that the money is an opportunity to not do any other work during that time to focus full-time on volunteering for a project they care about, the student is likely to stay around for much longer than the summer. This can be done by treating the student more like a volunteer than like someone paid to be on your team. Get the student to have code landing early, and often. Get the student addicted to restarting his nightly build and seeing his code is in use there. Encourage the student to not only fix things directly related to his GSoC project, but to also spend a few hours here and there fixing his own itches and looking into other bugs that make the product better for his own use cases. will get the student to touch code areas that will be relevant during the summer. can be completed by the student before the ends of the community bounding period (think of it as a 2-weeks project, but size it like something you would do in a rainy week-end. Remember that most of the time spent by the student will not be actual coding, but learning to interact with your team, and this is the very reason why this project is done during the community bounding period). once this small project lands, it will be highly visible, and will cause the student to receive appreciation from other people in your team/community. It's not always possible to find a project fitting perfectly here, but it's usually possible to find something close enough to fit the purpose of getting the student started. The Instantbird team will be using this 'small community bounding project' approach to starting the mentoring relationship for the third time this year. I tend to think that getting the student started on the right track is the most important thing a mentor needs to do, and if it's done correctly the rest of the mentoring is easy and pleasurable. This is just a reminder to students interested in applying for Google Summer of Code 2014: the application deadline is "21 March 19:00 UTC" and no late application will be accepted. If you intend to apply to Google Summer of Code this year and haven't submitted your application yet, don't wait: apply now! In 2006, I had the pleasure of being selected to participate as a student for the Mozilla organization. The work I did on the Page Info dialog eventually shipped as part of Firefox 3.0. In 2007 I applied as a student again, to a different organization, but unfortunately wasn't selected. However, I received an email from someone from the organization who told me the application was good and they would have liked to take me as a student if they had received more slots. He offered to mentor me if I decided to move forward with the project anyway, which I did! I completed the project and in October 2007, Instantbird 0.1 was released. 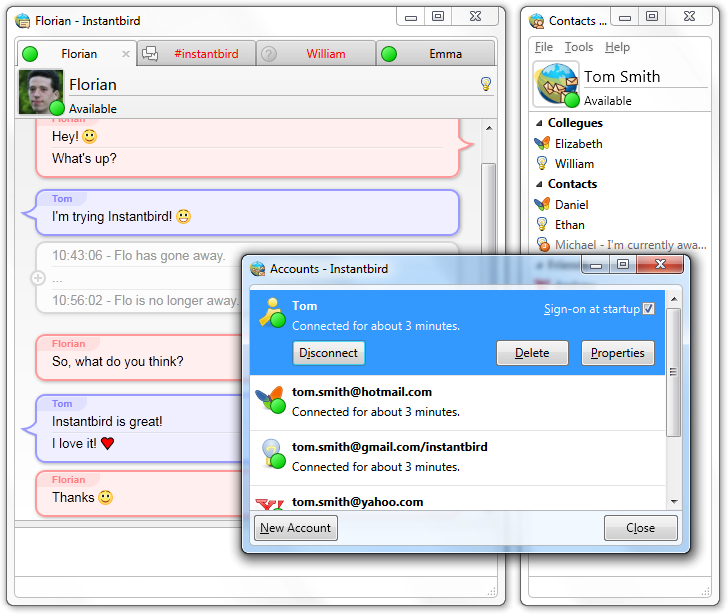 Instantbird is a cross platform, easy to use, instant messaging client based on Mozilla technologies. In 2007, I was selected by Mozilla for an internship in the Firefox team, and spent the end of the year in their headquarters in Mountain View, California. I think this was in large part because people were happy about the work I did in 2006 as a Summer of Code student. In 2008, 2009 and 2010, I focused on Instantbird, which had a growing community of volunteers improving it every day. I sent Summer of Code organization applications on behalf of the Instantbird community, but they weren't accepted. When I asked for feedback, I was told that we should try to work with Mozilla. In 2012, I mentored another student, who did some excellent work on improving the user experience for new users during the first run of Instantbird. In 2013, Gerv, who had been handling Summer of Code for Mozilla since the beginning in 2005, asked me if I would be interested in eventually replacing him as an Administrator. After some discussion, I accepted the offer, and we agreed to have a transition period. In 2013, I was backup administrator. I also mentored for the third year in a row. Unfortunately I had to fail my student. This was frustrating, but also a learning experience. In 2014, I submitted the Summer of Code organization application on behalf of Mozilla, it was accepted and we are looking forward to another great summer of code! On a more personal note, after being a Mozilla volunteer for years (since 2004), working on the Thunderbird team (from 2011 to 2012), and then on WebRTC apps (since October 2012), I'm starting in March 2014 as a full time engineer in the Firefox team. Which is the team for which I was a Summer of Code student, 8 years ago. Last Saturday at FOSDEM, I had the pleasure of giving a talk with Gerv about Mozilla's participation in Google Summer of Code. If you missed us, you can see the slides. This post is also a good opportunity to remind you to add your ideas to our brainstorm wiki page now if you are interested in mentoring a student this summer. Google will be running this year the 10th edition of Summer of Code. Mozilla has had the pleasure of participating every year so far, and we are hoping to participate again this year. In the next 3 weeks, we need to prepare a list of suitable projects to support our application. Can you think of a 3-month coding project you would love to guide a student through? This is your chance to get a student focusing on it for 3 months! Summer of Code is a great opportunity to introduce new people to your team and have them work on projects you care about but that aren't on the critical path to shipping your next release. there is a clearly identified mentor who can guide the student through the project. If you have an idea, please put it on the Brainstorming page, which is our idea development scratchpad. Please read the instructions at the top – following them vastly increases your chances of your idea getting added to the formal Ideas page. The deadline to submit project ideas and help us be selected by Google is February 14th. Please feel free to discuss with me any Summer of Code question you may have. From 2007 to late 2013, Instantbird bugs were tracked on bugzilla.instantbird.org. This was fine as long as Instantbird was completely separate from all other Mozilla products, but when Instantbird's chat backend was re-used to add instant messaging to Thunderbird, we started having bugs that were relevant for both Instantbird and Thunderbird. Having them in two separate bug trackers was messy and caused lots of duplicates. We started discussing this at MozCampEU2012 in Warsaw. It quickly became apparent that getting a product created for Instantbird and another one for the chat core wasn't a problem, but that importing our existing bugs would require more work. The plan at this time was to import the existing BIO (bugzilla.instantbird.org) database into BMO (bugzilla.mozilla.org). Unfortunately, while it seems bugzilla already supports importing bugs from plenty of other bug trackers, it doesn't support importing bugs from itself. Some people from the BMO team thought writing such an importer would be a nice and not-very-difficult project, so they agreed to work on it. We filed a bug to figure out the details. And nothing happened for months, because there were (understandably) higher priorities for the BMO team. Ten months later, the BMO team concluded that they were unlikely to ever get time for this project, and suggested we work on another solution instead: using BzAPI to do the import ourselves. This was more work than we could get done immediately, so we kept that in mind for later. Patrick Cloke started experimenting with BzAPI but couldn't get enough of my and others' attention to complete the project. slice the content of each file from 1. into a stream of events (each event is an action performed by the bugzilla users). merge the events of all bugs into a single file; without duplicates (eg. when marking a bug as a duplicate of another bug, this creates events on both bugs, but we only need to import one, the other happens automatically). replay events on BMO: this needs to create a map of new bug and attachment numbers, and replace them automatically in comments. BzAPI has lots of documented (eg. can't create an attachment at the same time as filing a bug; can't set the component without also setting the product, ...) and undocumented (eg. UTF8 is supported when filing a bug or adding comments, but not when commenting on an attachment) limitations. The format of data downloaded from BzAPI is significantly different from the format of data we need to send it to do changes. This is especially true for attachment flags. Sometimes the values in bug fields don't match what's in the history of events that happened to the bug. This problem occurs when users changed their bugzilla email address, when products got renamed. The worst case we had to deal with was a target milestone that was renamed, then a new target milestone was created with the original name, and some bug's milestone was changed from the renamed milestone to the new milestone with the original name. This caused an interesting complication because we ended up with changes where the mapped value was the same before and after the change. We initially started using the js shell for our scripts, but to do HTTP requests, we needed XPCOM, so we switched to xpcshell instead. Unfortunately, xpcshell's readline() function truncates input data after 255 characters. Later I discovered that xpcshell doesn't handle UTF8 input/output by default, and had to use nsIScriptableUnicodeConverter for that. Our scripts are all in the bio-merge hg repository. The result of step 4. is a 120MB text file with each line being the JSON representation of an event that needs to be replayed. We tested replaying events on bugzilla-dev.allizom.org first for a single bug, then for a few set of bugs that had dependencies. Finally we replayed our whole set of bugs (2294 bugs, 20984 events), and after fixing the issues that surfaced during that test run, we were ready to do the final import. The final import took 848 minutes to complete (14 hours). 240 events failed to replay because some components didn't have on BMO the exact names the script expected. I fixed the script and replayed these again. We finished by adding comments in all existing BIO bugs giving the new URL, and closed BIO (it's now read-only). As of 2013-12-30, new Instantbird bugs should be filed on bugzilla.mozilla.org, in the Instantbird product for UI bugs, in the Chat Core product for backend issue (this part of the code is shared with Thunderbird), and in the Instantbird Servers product of issues with our servers. Instantbird 1.0 vient de sortir. Cette version apporte de très nombreuses améliorations. Cette fois ci, non seulement le logiciel en lui-même est traduit, mais le site web aussi, alors pour savoir ce qui est changé depuis la version précédente, il suffit donc tout simplement d'aller voir sur le site d'Instantbird lui-même . De nombreux blogs reprennent déjà l'information. N'hésitez pas à faire de même (ou à partager sur Facebook ou twitter) afin que vos amis en profitent aussi ! Après des mois de développement, Instantbird 0.2 est finalement sorti cette semaine dans plusieurs langues, dont le français ! Cette nouvelle version a été l'occasion de revoir complètement le site web afin de mettre l'accent sur l'utilisation d'Instantbird, et en particulier sa simplicité, plutôt que sur les technologies mises en jeu. Instantbird, pour la première fois en français ! Hier, Instantbird 0.2 beta 2 est sorti, et pour la première fois il est disponible en français ! Cette nouvelle version beta apporte bien sûr son lot d'améliorations. Pour lire les détails et la télécharger, c'est par ici ! Samedi, j'ai eu le plaisir de participer au Mozilla Add-Ons Workshop à Paris et de donner une conférence sur la création de composants XPCOM en C++. Les slides de ma présentation ainsi qu'un fichier zip contenant l'exemple présenté dans les slides sont disponibles. Les slides sont conçues pour être vues avec l'extension FullerScreen. Cette journée a été très réussie et, au passage, a permis aux différents membres français de l'équipe Instantbird de se rencontrer.